you hear this every other year throughout Kunovice’s streets… in that call you hear the time that would pass through the country and people’s lives bringing them temporary worries and joys, ever-changing its meaning yet always leaving behind its footprints. In the mind, in memory, in the heart of everyone who cares about its traces, everyone that cares about preserving and filling the treasury of traditions of our predecessors, about fostering the beauty of Slovacko’s folk culture, about its richness. One of the jewels of the treasury of time is The Ride of the Kings. On that account, the deft hands of women get to work early in the year in the months when the Sun is low above the horizon with its rays shyly brightening the days in order to create the splendor which we relish, which we admire for its freshness and uniqueness. It is a profusion of colors and various decorations put together very skillfully into marvelous compositions which on the day of the festival shine on the backs of the horses. It takes an excellent rider to understand the horse’s soul, to know its needs, to harmonize the speed and the breathing, sense the environment and on top of this to be able to react nimbly and wittily through rhymed calls to new and unusual circumstances. In the wake of the spring the royal suite takes to the streets to accomplish their mission. 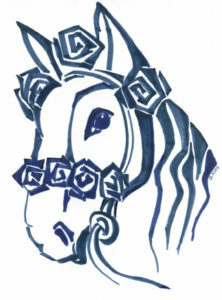 The month of May, its second half, at the daybreak on Whitsunday the young men gather in places where their horses get decorated with the colorful paper flowers. They are pinned to a big red Turkish scarf so typical of Kunovice. It covers the horseback and is partially hidden under the rider’s saddle. Multicolored fringes then beautify the sides and the manes of the horses. How inspiring the Kunovice embroidery is! What a delight to see! The rider’s heart beats proudly and his message to all the people seems like…”I made it, mummy, I made it…” Every horse’s decoration is unique, the same can be said about the horse’s and the rider’s characters. The sun, God willing, favours us, it has risen and brightens the streets that are being filled with riders dressed up in folk costumes sitting on their gorgeous horses. Whoever saw it, will never forget. The men greet each other arraying their horses on Pansky dvur to form a circle and – assisted and guided by older and more experienced men – look for their places in the procession. They keep circling. The circle looks like a symbol of connection, cohesion and circulation of life. Only then does the procession leave the yard heading first to the Church of St. Petr and Pavel. For everyone to get a blessing. The riders, the horses, the whole king’s suite. Everyone. We all need it… Thanks. Everything in life has an order. Also the king’s suite procession. Now they are about to pick up their king. The suite moves on meekly, the men are silent, all you hear is the hooves clopping to the rhythm of the brass band that is leading the convoy. 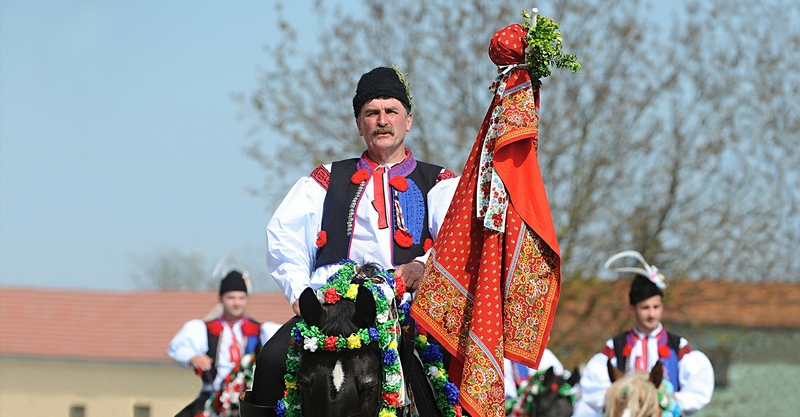 The group is led by a flag-bearer riding a black stud. He is the natural leader, one whose experience and skills surpass the others’. In Kunovice it has been for a long time a charismatic man Milan Stašek. His horse is decorated with wreaths and colorful ribbons, both under his seat and on the flagpole anchored in his boot there is a red Turkish scarf. The flag flutters jubilantly as if enjoying the view of the countryside. The flag-bearer is followed by two to three trumpeters their horses being decorated the same as the barkers – collectors who ride after them with alms boxes attached under their saddles. Then there are three so called ministers who differ from the previous in their function and decoration too. The ministers are followed by two pages. They are the bodyguards of the king dressed in women’s clothes and white linen trousers. The names of these pieces of garment sound magical to foreign ears.. třaslavice, krabovačky, kordula… for most of the year they lie in the wardrobes and show up only during this festival. The pages’ costumes consist of typical women’s accessories and on their heads there are chaplets to which ribbons are sown so their faces are hidden. For concealment reasons. In the past, kings were often captured and pages had to protect them with sabres. The clashes would result in wounds and the pages were supposed to stay anonymous for possible revenges. The pages hold sabres even now riding on richly decorated white horses. In front of the king’s residence the procession pauses. The flag-bearer and the ministers plead the father to let them have his son as the king. A precious moment. One of a kind. to deliver a message before it’s late. And we hope to find a king for whom we pray. And hold a royal treasury on our walks. There’s but one thing I want from you. whereupon he escorts a beautiful white horse out of the gate with his son sitting on its back. The king for another two years. At this moment the most important person in Kunovice. A bearer and continuator of traditions. He is not a small boy any longer. He is the king. He is leaving his home. Freed from his father’s authority. Alone. He is put in other people’s custody. The father’s face shows emotion. The power of the moment filled with emotions is reflected in the faces of the people around. His childhood is gone having turned into adolescence. Hard to forget. The king… Upright, with arms akimbo he is sitting on his white horse waiting. He is not holding the bridle or the reins. Clad, the same as the pages in women’s clothes, with his face hidden behind the ribbons hanging from the coronet letting the wind reveal a bit of the mystery, particularly the boy’s mouth locked up with a white rose between his teeth. No face, no voice. Shrouded in the mystery of ancient times he is approaching the suite. The pages couple the reins of their horses to that of the king, behind them array the other barkers, a last glance and the procession sets out for the journey. The king and twenty six riders are heading to the town hall to request Ivana Majíčková, the mayoress, to grant them a permit to tour the town and collect money for the king. You’re welcome to Kunovice Kings’ Ride! The Ride of the Kings always kicks off on Monday morning. The whole festive weekend includes various events which were in this year dedicated to the 20th anniversary of the restoration of The Ride of the Kings in Kunovice. As early as Friday afternoon, the mayoress welcomed the king’s suite in Pansky Dvur community center. The whole suite of riders was introduced and instructed how they should accompany and protect their king. Subsequently, they confirmed this by signature in the memorial book of the town. All former kings and riders met in an all-evening program called “Handing Over the King’s Crown” in King’s Ride Park. Radovan Siman, the king regnant, handed over the crown to the new king, Adam Hlaváč, in attendance of the king’s suite and Handrláček folklore group. On this occasion, a new book by Dalibor Gregor and Josef Iš titled “A Horse for the King” was introduced to the public and the evening went on with a performance of the cimbalom band of Kunovjane. 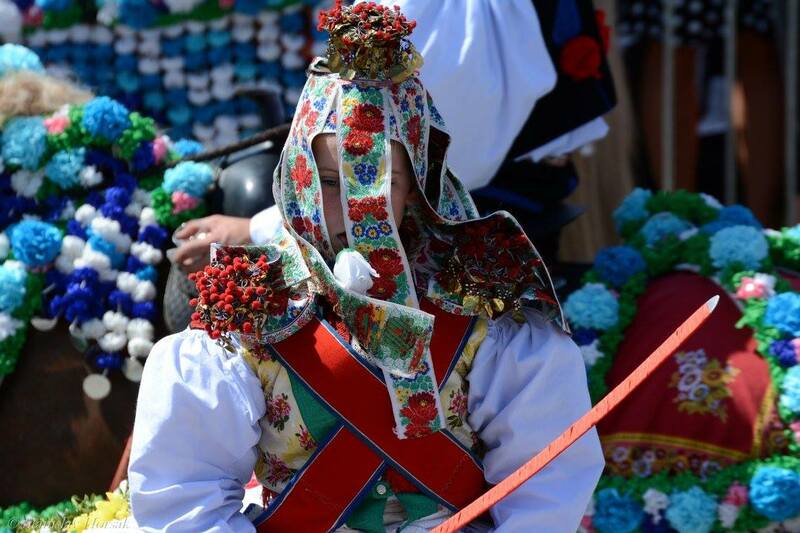 Saturday’s “Carman Afternoon” has become a traditional part of the Ride of the Kings in Kunovice. Over a relatively short time it has become an event which horse fans look forward to and prepare long ahead of time. Horse keepers like to show their horses in harness. The public has taken to this show and the rides in various carriages have become very popular. Similarly, they capture more and more experts many of whom have already taken part in this attraction before. The visitors could see in miscellaneous horse teams Czech breeds, such as Belgians, Haflingers, Pinzgauers, Welsh and Shetland ponies or cross-breeds of a Czech warmblood with an Arab. Also attractive black Friesian horses drew attention of the public. Kunovice also saw the first-time appearance of Brabant horses, imposing animals used in the Benelux countries for pulling out dragnets, distribution of beer barrels and the like. Likewise, for the first time the visitors got to see the breed Shagya Arabian bred in 19th century in Hungary. The whole carman convoy at first paraded through the town starting from the town hall, which was aptly commented by a horse expert Martin Foretník. All folklore groups of the town sit on the carriages and wains inviting the by-standers for the afternoon and evening programs. The view of a procession made up of three dozens of various types of carts and buggies or whatever pulled by horses is just unforgettable. Following this show the visitors were offered to take rides in the carriages through the town till late afternoon hours. Saturday’s afternoon programme consisted of performances given by local ensembles and their guests. It was opened by Hradcovjanka brass band on Svoboda square and continued by groups from Kunovice in the program called “And This Is Our King” on Pansky dvur quadrangle. This is where took place a preview of an exhibition “Folklore Metamorphoses” whose authors were students of the art school in Uherske Hradiste along with the pupils of Kunovice’s art circle of the Basic School of Arts in Uherske Hradiste. The other pleasures for eye and soul were two exhibitions in the lecture hall and vestibule, the former dedicated to St. Constantine and St. Method’s mission and the early years of Christianity was called “Mission In Context and Causalities”and the latter’s title was “Prehistory In Kunovice”. Slovacky Wine Cellar hosted wine lovers who tasted wines to the music of Ludova hudba Polun from Stara Tura, Slovakia, a partnership town of Kunovice. Lots of visitors were excited to see the traditional evening program “For the King, Mother, For the King” featuring the King’s Suite and the new king. Commemorating the 10th anniversary of its foundation therefore warmly accepted by the public the cimbalom band Ohnica provided musical accompaniment for the whole evening. Since early hours Sunday belonged to the riders. After the chanting outside the town hall during which the barkers glossed current events in Kunovice and around with humour and sarcasm, the suite set off to tour the town which lasted till late afternoon hours. While collecting money for the king’s treasure they amused the viewers by their apt and funny chanting. Men’s choirs’ turn came shortly after the king’s suite left. At the same time, visitors to Kunovice could again get to take rides in carriages through the streets. “The Wine Fair” at Pansky dvur offered a wide scale of white and red wines from renowned winemakers in the region. Also brass band music lovers got their money’s worth listening to Svatoboraci brass band. The heritage house at Zahumni street was the place where visitors could see how people lived a hundred years ago plus there was a demonstration of how the paper decorations for horses are manufactured. In the afternoon, a mass service for all living and deceased people who have so far taken part in the Rides of the Kings in Kunovice, in particular kings, riders, organizers or sponsors. The mass was celebrated by General Vicar Monsg. Josef Nuzík who arrived in a period carriage drawn by four Kinsky horses. In attendance were four guardsmen in period uniforms and four riders in Kunovice costumes riding Friesian horses. Sunday’s program at Pansky dvur includes a regional round of “The Best Child Verbunk Dancer” competition, which has become quite a phenomenon as well as The Ride of the Kings that has been listed on UNESCO Intangible Cultural Heritage list. Later on, viewers could enjoy the performance of Rozvadzan folklore group, full of original ideas, enthusiasm and joy of dancing. Sunday’s program was topped off by a concert of famous Stribrnanka brass band with its soloists. In the meantime, the king’s suite has reached Pálenice cultural house to thank the parents and hand over the king. Without thanking the parents and the family for the king. Thus, thank you a lot. The king, pages and riders dismount the horses, their keepers take them away. Since early morning till late afternoon they have walked kilometers in the streets. Happy and proud smiles on the riders’ faces burnt by the blazing spring sun show satisfaction from a job well done and a joy of being part of this ancient tradition. A unique and indescribable feeling. Come again in two years to feel this remarkable atmosphere. 20:00 To the king, mother!